This simple fresh summer dish is a specialty from Laos. Larb is an exotic sour-salty salad with cooked ground meat and fresh herbs. 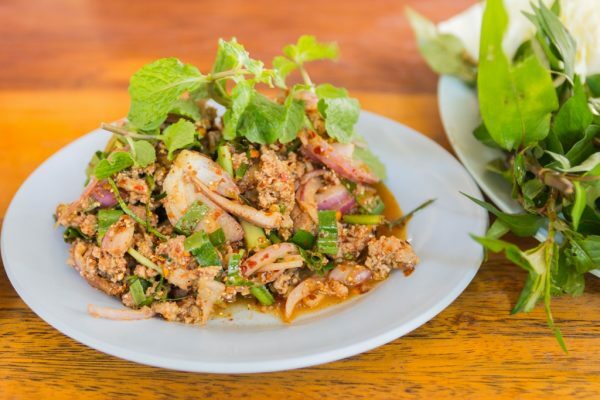 Larb is originally very hot and served with unseasoned vegetables to balance the intense flavor. Our seasoning provides the basic with a mild hotness. Add as many fresh chilies as you can take. Our tip: After cooking the meat, keep the cooking water. It’s a delicious broth that you can use to make another dinner. Peel and cut potatoes and root vegetables into the same size: either 1/4 inch for fast cooking or 1 inch for fast cutting. Cook them in the broth to create a Cuban style soup. Substitute beef with any other ground meat, or vegetables (recipes below). Substitute 2 green onions with 1/2 red onion. If not using fish sauce, add 1-3 tbsp anchovy paste. Add chopped cilantro or Thai basil. Discover New Flavors Every Month! In a POT, add meat and stir for about 5 minutes until it’s crumbled and fully cooked. Don't add oil or water. Transfer meat with its liquid to a BOWL and let cool. In the BOWL with the meat, add Larb Spices, 3 tbsp lime juice, 2 tbsp soy sauce or fish sauce, onions, mint, and sliced chilies to taste (optional). Mix well. Add salt or lime juice to taste. 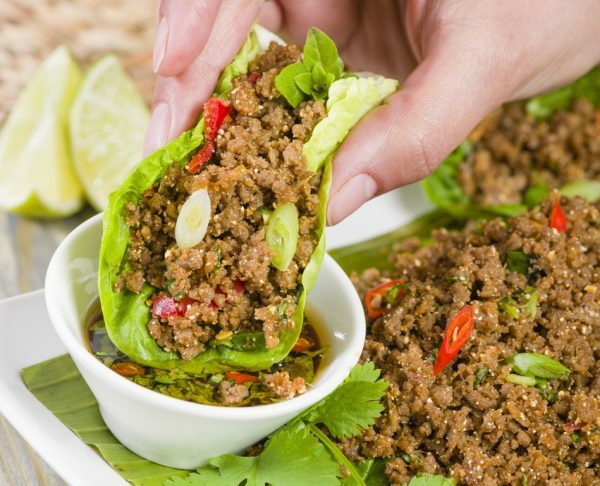 Serve larb with rice, lettuce leaves, cucumbers, and tomatoes (optional). Sprinkle with chopped nuts (optional). In a FOOD PROCESSOR, chop 1 head raw cauliflower into rice-size pieces. Fry cauliflower until cooked but still a bit crisp. Transfer cauliflower to a BOWL and let cool. Chop 1 lb of your favorite mushrooms into about pea-size pieces. Saute mushrooms until they are cooked. Transfer cauliflower with their liquid to a BOWL and let cool.